Product #32035 | SKU MOTORR L2000 | 0.0 (no ratings yet) Thanks for your rating! The Motorroid L 2000 Slider Motorised Kit from Varavon is an add-on for select Slidecam camera sliders that turns the slider into a motorised system. 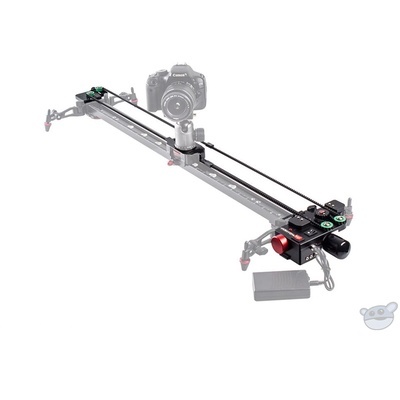 It features a motor, pulley system, and a saddle for attaching an included belt to the camera carriage. This version includes a belt compatible with Slidecam LITE, Slidecam V, Slidecam S, and EX PLUS models up to 78.7" in length. The motor and pulley system mounts easily to the ends of the tripod and doesn't interfere with leg movement. Simple left, right, and stop movement control is performed using a single switch, with a dial providing acceleration adjustment. Limit sensors ensure that the motor doesn't keep running when the camera carriage reaches either end of the track. For shorter, repeatable slides, a pair of included limit clips can be placed onto the belt and will trigger the limit sensors to stop movement. When more advanced and programmable control is needed, including camera shutter release for time-lapse videos, an optional Timeroid controller is available. To power the motor, the kit includes a 110 to 240 VAC power adapter, though it can also be powered using a separately available battery pack for enhanced mobility.